Joe Lyons has a BA from Harvard College, 1993, and a JD from the University of Pennsylvania, 1999. 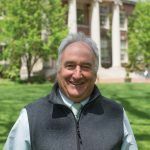 He taught at Phillips Exeter Academy and at the American School in Switzerland as a history teacher before coming to Deerfield. He also practiced law in Boston for five years and served as a law clerk on the United States District Court for the District of Maine.